One of my first paintings created in my new studio was “The Dog’s View” which gives the viewer an insight into my studio and my life as an artist. 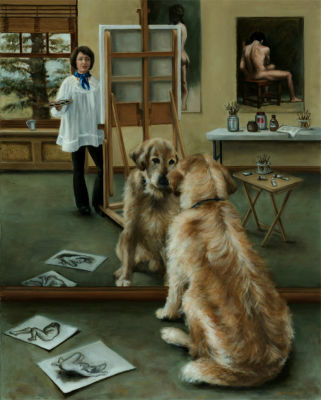 The original name of the painting, suggested by my husband, was “The Studio Dog” because my dog Elvis is a frequent visitor in my studio and most of the time he just lies on the floor there looking in the wall size mirror or watching me paint and thus participating in the creative process. I often wonder what he is thinking while watching me therefore I wanted to show my studio as seen by my dog, hence the name.